Mukteshwar sightseeing- Best places to visit in Mukteshwar | Uttarakhand Travel Guide | Travel guide & Adventure guide in Nainital. 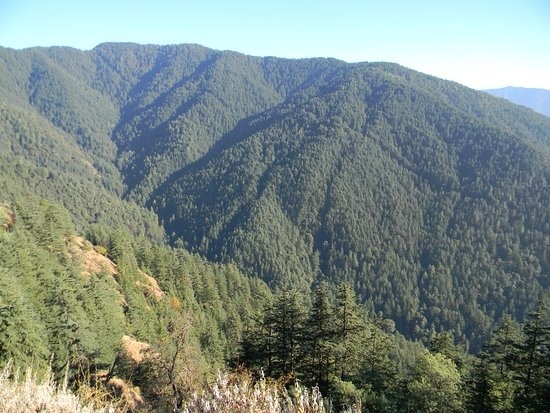 Mukteshwar is one of the most popular tourist destinations of Uttarakhand and is known for varied flora and fauna and rich biodiversity, even Jim Corbett visited this place to kill the infamous men eater "Mukteshwar ki sherni" about 80 years back and described Mukteshwar as the hilly town comprise of beautiful apple orchards and deodar's forest. Got its name from the famous 350 year old Bhagwan Shiva's temple, Mukteshwar dham, mukteshwar also known for offering 350 kms view of the great Himalayas. Chauli ki jaali- Chauli ki jaali is a name of Mountain ranges situated in the heart of Mukteshwar. The view of Valley from Chauli ki Jaali ki breathtaking and i mean it. Chauli ki jaali is situated at very high altitude, that's why the view from chauli ki jaali is very thrilling.One get the feeling of top in the world. Muktehwar Mahadev Temple- Let's talk about Shivratri, Shivratri is of high value in the festivals of Hindu religion. The festival of Mahashivratri is celebrated in Kumaun's Jageshwar, Binsar and Mukteshwar's Mukteshwar Mahadev since old age. When it comes to Mahadev Shiv, it also comes with Kumaun's "Mukteshwar" in Nainital district, Mukteshwar is home to famous Shiv temple "Mukteshwar Mahadev", it is also known in one of twelve jyotirlingas. Behind the Mukteshwar Mahadev temple there are mountain ranges called "chauli ki jaali". There is a spherical hole in a huge rock in the middle of these mountain ranges. According to popular beliefs if an infertile women passes through that hole, the women gets blessed with child. It is believed that the hole was created by Mythological character "Bheem" during the Mahabharata period. Later, a saint mahatma got to know about this magical spherical hole in Chauli ki Jaali. Since then, every year, infertile womens from differnt parts of India visit this place to get blessed with child. Bhupesh Kannaujia, who is associated with journalism in Mukteshwar, tells that he met three womens who were earlier declared infertile by the doctors, got child after passing through the hole. This place Mukteshwar and Chauli ki Jaali is of prime importance regarding belief and faith of people. Also this place has tourism impotance. 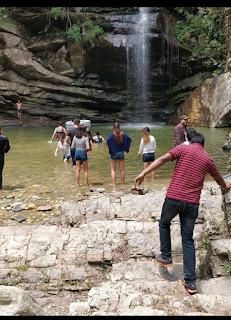 Bhalu Gaad Waterfall- There is a beautiful waterfall in the Mukteshwar, 4 or 5 kilometres prior to Mukteshwar "Bhalu" is a Kumaoni word which in hindi translates to "Best", and "gaad" translates to "water", Bhalu Gaad is a natural. 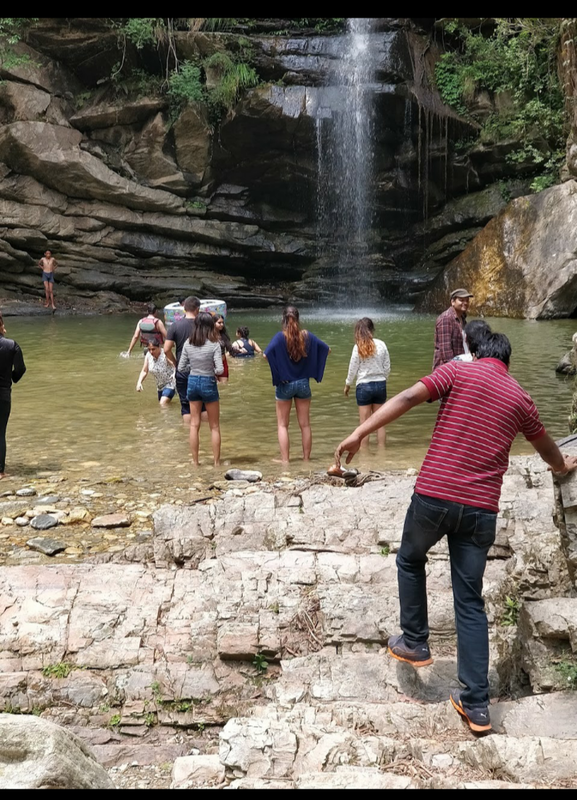 This waterfall is nestled inside 1.2km of hills and it is an easy trek to Bhalu Gaad waterfall. The trek to the waterfall takes half an hour and all the way through one will enjoy being in the abode of nature. Opening early morning and closing time 04:30 hours. If u want to do something adventurous, visit this waterfall. 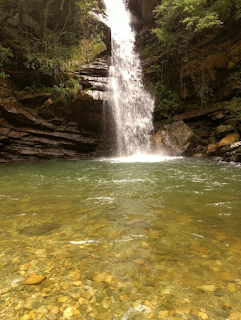 If you are interested in swimming then make sure to take life jackets with you, as the water near the waterfall in around 20-30 feet deep. A mere 10 rupees are charge as entry fees and there is a small restaurant as well for having light food. View of Himalayas from Inspection bungalow- Mukteshwar offers more than 300 km long stretch of Himalayas. 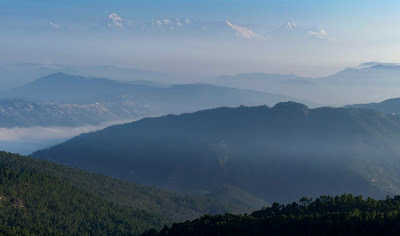 The famous Himalayan peaks visible from Mukteshwar includes Chauhamba, Nanda Ghunti, Nanda Devi, Nanda Devi east, Panchachuli, Kamet, etc. Mukteshwar Methodist church- One of the oldest churches of Nainital district, constructed by Britishers pre independence of India. 150 metres long valley crossing is done in Chauli ki Jaali. A thrilling activity to do, this activity will definitely get you goosebumbs, and a 2000 metre deep ditch add flavours to this activity. A must do activity for an experience of lifetime. We provide taxi services to visitors too..
GET SEDANS AND SUVS AT MOST AFFORDABLE RATES IN UTTARAKHAND. PLAN YOUR TRIPS WITH US.